multimedia presentations and natural history lectures by the naturalist guides about the upcoming day’s excursions. 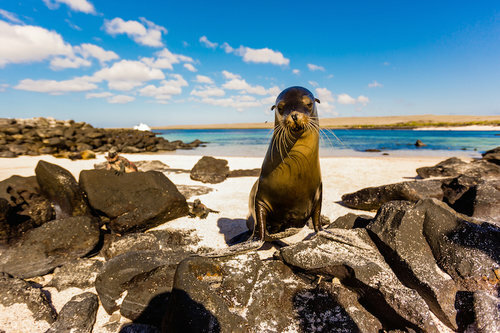 With itineraries designed by Galapagos experts, the Yacht La Pinta cruise makes sure to balance out the best islands and most relevant species for an ideal Galapagos Big 15 wildlife experience. For a more exclusive look at the flora and fauna, the Yacht La Pinta visits sites rarely frequented by other ships: in fact, 84% of visitor sites are not shared with other vessels. 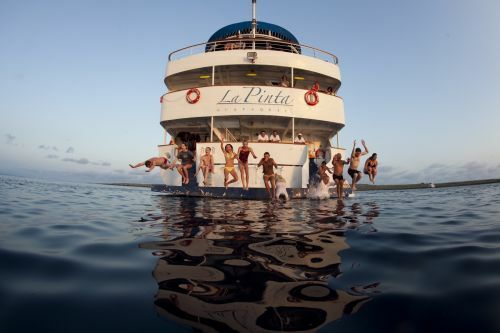 Morning and afternoon excursions on the Yacht La Pinta Galapagos cruise will include exciting aquatic activities such as riding in the glass-bottom boat, kayaking, snorkeling, swimming, and skiff coastal exploration. The glass bottom boat is a very unique offering that is perfect for those who don’t want to snorkel (and offered by very few Galapagos cruises). Sea kayaks and all snorkel equipment are available onboard for the guests, as are wetsuits. Kids will love to join the Pirates Aboard program, offering age appropriate education, activities, and fun! Children and adults can look forward to spotting sea lions, blue-footed boobies, turtles, dolphins, iguanas, albatross, and maybe even a shark or whale on the daily excursions. 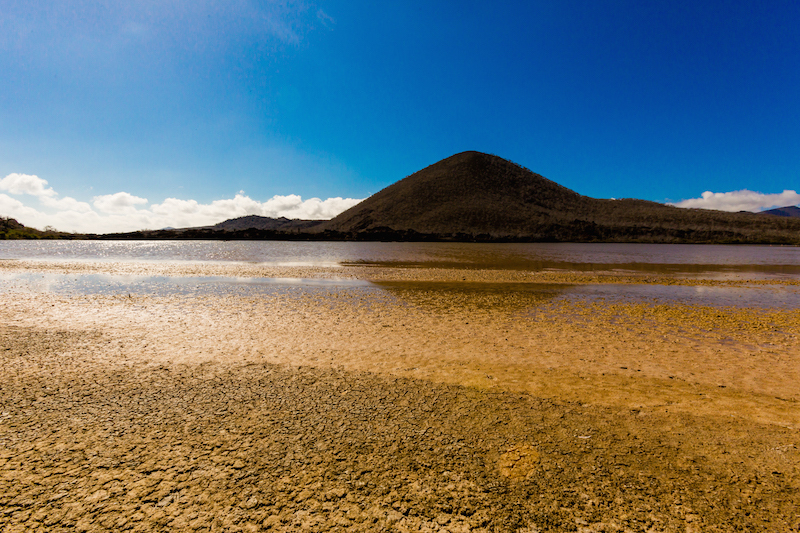 But of course, in between these exciting adventures, you will be able to return the luxurious Yacht La Pinta where the beauty of the Galapagos Islands continues. The generous accommodations on Yacht La Pinta feature floor-to-ceiling oversized panoramic windows in every cabin, to make sure you never lose sight of your surroundings. 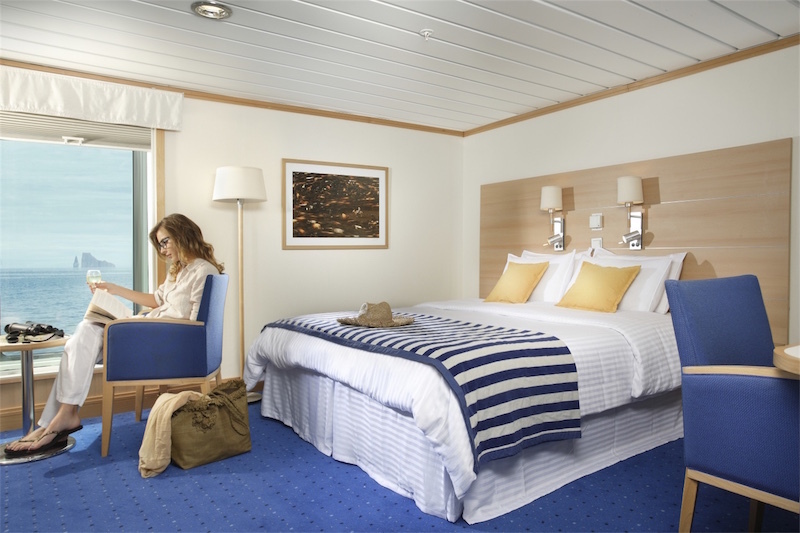 With a modern, nautical design and premium amenities, each room is a relaxing oasis in between your adventures. 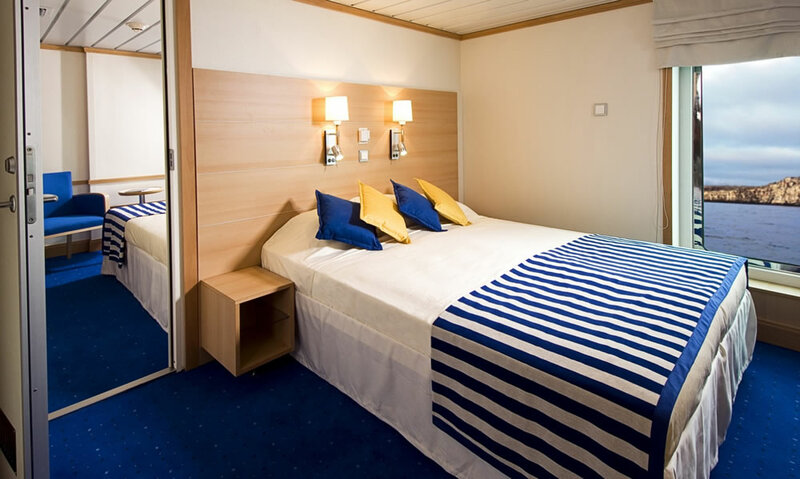 Each cabin has a bathroom, sitting area, air conditioning, safe deposit box, and telephone to keep you comfortable. 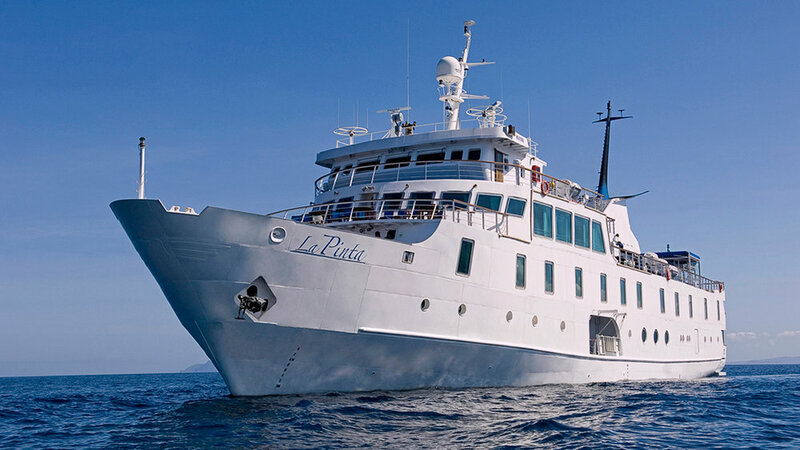 Ideal for families or groups traveling together, the Yacht La Pinta cruise also features 8 connecting cabins and 4 larger cabins with a sofa bed. As comfortable as her rooms may be, there is a wealth of communal spaces on board the Yacht La Pinta to take advantage of as well (her guest to space ratio is among the top 5 in the Galapagos). Numerous outdoor social areas offer almost permanent visual contact with the passing landscape, perfect for taking in the view or bringing out your camera. 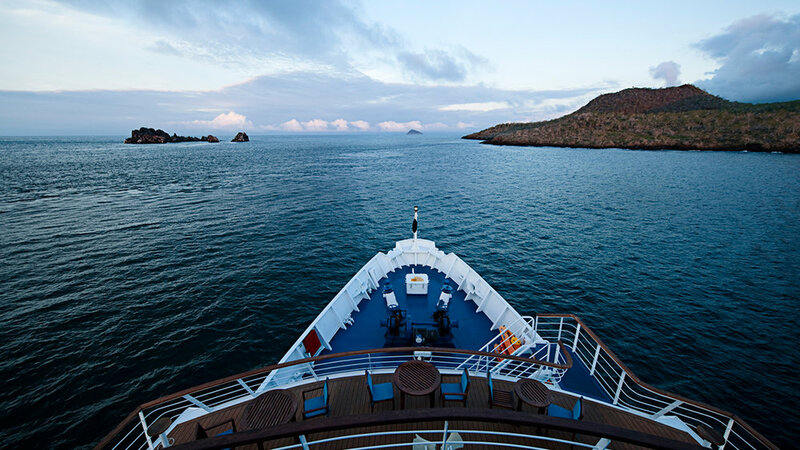 On the Yacht La Pinta Galapagos cruise, you’ll always be right in the midst of the breathtaking scenery. Take it all in as you enjoy al fresco dining on the outdoor terrace, stargazing from the observation deck at night, or appreciating the 180 degree views from the bar lounge. Guests will love unwinding in the hot tub, breaking a sweat in the cardio-gym, or sunbathing in the lounge chairs on the sun deck. One certain perk of cruising on a larger vessel is the range of amenities not often possible on much smaller yachts. Those who need to remain connected will appreciate the on-board telephone with direct international dialing, a multi-channel sound system that connects to iPods, and complimentary WiFi. Beyond the sophisticated facilities, the service and gastronomy on the Yacht La Pinta Galapagos cruise are also some of the best in archipelago, with attention to detail that will delight even the most well traveled guests. The Yacht La Pinta Galapagos Cruise prides herself on her dedicated crew of twenty-seven, who are welcoming, attentive, and prepared to assist with any needs you may have. A Medical Officer is permanently on board and available 24/7 for free consultations. Navigating Yacht La Pinta are top ranking naval officers acting as Captains and First Officers. 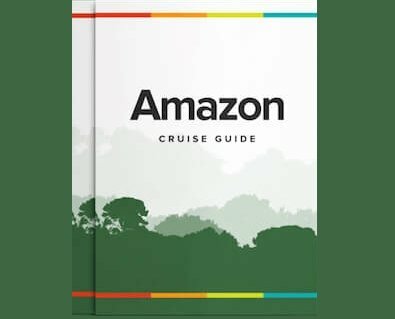 Expedition Leaders are present to guide guest activity, and experienced Naturalist Guides (on average, one for every eleven passengers) have been selected to lead on-shore excursions. Naturalist guides are bilingual in English and Spanish, however services can also be offered in German, French or Italian at the request of groups larger than 10 guests. With additional support coming from the ground operation office in Puerto Ayora, there is guaranteed assistance every step of the way. The Cordon Bleu-trained gastronomy director will make sure guests can expect the finest cuisine along the journey, with a range of gourmet international options and Ecuadorian delicacies. Special dietary needs can be easily accommodated, just make sure to let us know if advance. With the Quality Assurance Department regularly evaluating the quality of service provided by all staff aboard Yacht La Pinta, they ensure your experience will be nothing less than perfection. 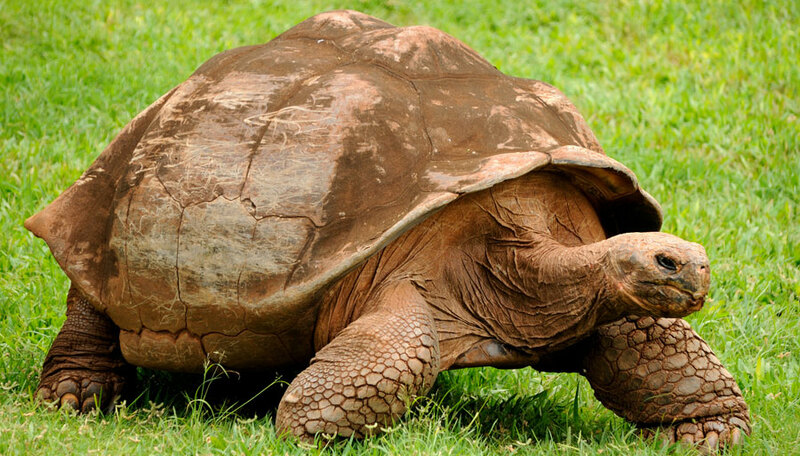 And all of this takes place under the supervision of industry leaders in Galapagos cruising, with over sixty years of experience and social responsibility in the region. 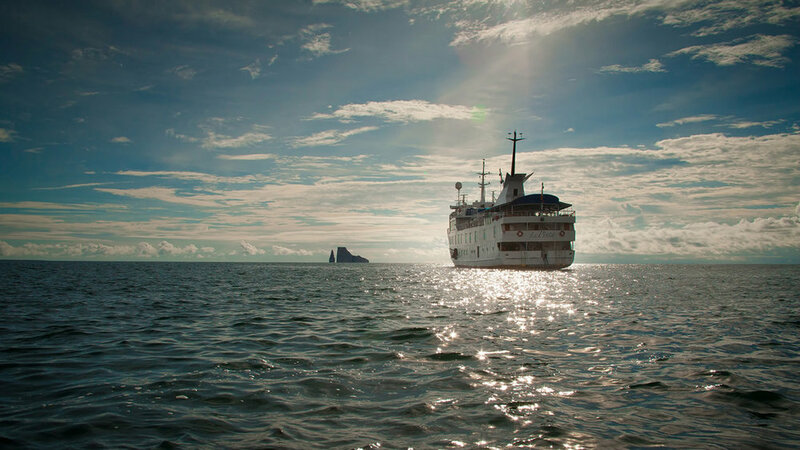 As the first tour operator to offer cruises in the Galapagos and the only tourism company in Ecuador’s Top 500 list of companies, we operate the Yacht La Pinta Galapagos cruise with best business practices and a commitment to sustainability. Modern engine technology promises lower fuel consumption, and an on-board water product and treatment plant help reduce the environmental impact of our guests. Long-standing social and environmental programs support the local community, and aim to increase the positive benefits of tourism’s impact while reducing the negative. For families and those who appreciate the comfort of a larger vessel, the Yacht La Pinta Galapagos cruise is a great option for those seeking a luxurious cruising experience with unique features and premium service.